FREE admission and the chance to pay the bands direct during the show. Fast and loud nihilist punk band established in 1976. They've gone through a few members since then but still have two originals and a blistering live set with one of the most in-your-face openings you're ever going to see. Often called punk's best-kept secret, their records are collector's items, as rare as they are potent. Formed in 2016, this three-piece has forged a fearsome reputation as one of the most exciting and volatile live acts in London. Equal parts frantic, considered, ear-splitting and melodic, they take cues from early DIY punk and post-punk pioneers from Crass to Flipper to Wire and The Fall. 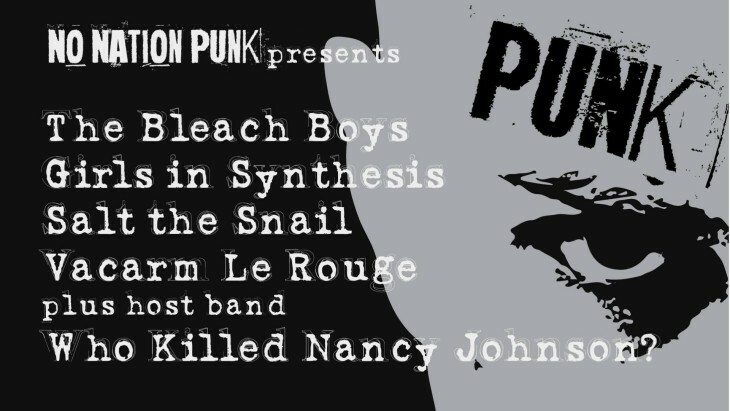 “As exciting as the first time you heard your favourite band their music is intense and abrasive… like a jarring, adrenalised version of life in Britain and every band that’s made you feel alive” - The Punk Lounge. “A truly exciting, exhilarating assault on the senses” - Louder Than War. Utterly brilliant band from the Widnes/Liverpool area whose songs are stuffed full of references to pop culture, from Lazer Quest to WWE. Don't read this, though, check out the video for their song Spanish Announce Table: www.youtube.com/watch. Three-piece speed-freak no nonsense political punk rock and roll from a classic Toulouse band currently celebrating its 30th year touring. Rarely seen in the UK, we're delighted to welcome them to High Wycombe for the first time. Since their first gigs at the start of 2016 Reading-based WKNJ have grown into one of the most exhilarating live bands on the circuit. Strong songs, constant movement and a touch of theatre. Not to be missed. No Nation Punk is a non-profit DIY outfit bringing exciting UK and overseas punk bands to local venues. The price? You decide. It's free to come in, and once in you can listen for free and then pay the bands you choose, direct, whatever you want and can afford - or just buy their merch.